For most hot tub owners their hot tub is a source of enjoyment, relaxation, and therapy. I know for myself my daily hot tub is a source of relief from my weekend warrior sporting days, and without that daily hot tub I don’t feel loose or sleep as well. To that end we keep our hot tub running at optimal levels, and stay ahead of the maintenance. Although hot tubs don’t require a lot of maintenance, their are two key elements above all else you have to keep on schedule and is of the upmost importance to a hot tubs proper function. The first requirement for a healthy hot tub is ensuring that the water chemistry is optimum. Bad water chemistry will cause damage not only to your hot tub equipment such as your pump and hot tub cover, but can also be unhealthy. The next item of maintenance you need to stay ahead of and the focus of this post is keeping the hot tub filter clean and free from grime, dirt, and blockages. The simplicity of it is that water can’t flow through a clogged, dirty filter, and if the water is not filtered, contaminants are not removed from your tub. The blockage of the hot tub filters puts strain on the pump, and worse will shut your power pack down if not operating correctly. The blockage of your hot tub filter will also compromise the clarity and cleanliness of the hot tub which of course is not good for your health. The good news is keeping your hot tub filter clean isn’t difficult, it is merely setting a schedule and keeping to it throughout the year. Here you will find a few tips on how to clean your hot tub filter as well as when and how often your hot tub filter should be cleaned or replaced. The first thing you need to do is purchase a good cartridge filter cleaning device. A simple garden hose with it’s normal attachments will not only take you longer to clean your hot tub filter but just can’t complete the job as thoroughly as a hot tub filter cleaning wand like you see in the image on the right. Most of the filter cleaning wands work in the same way, they are attached to the garden hose and send water through a number of fingers that split the pleats in your hot tub filter. 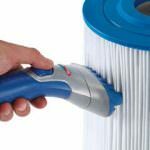 The hot tub filter wand makes cleaning the filters quick and easy. Another item that aids a hot tub cartridge filter is Scum Ball or scum remover. A scum remover absorbs body oils, makeup, and the like and aids the filters. This will not only keep your water in a better state but will improve the filters capacity and level of performance. To keep your hot tub filters working at an optimal level you also need to not only remove dirt and debris, you must also remove body oils, residue, and bacteria from the hot tub filters. The only way to do this properly is to use a degreasing agent meant to clean cartridge filters. A cartridge cleaner is best suited for removing that tough grime that is impossible to remove with just water. The cleaner breaks down the oil and grime making it easier to rinse away. Climate and hot tub usage will be the main reason you will need to clean your hot tub filter. The more you use your spa or the warmer the climate the more you will need to clean your spa. However, a good rule of thumb for cleaning your hot tub filter is once every two weeks. To do this, simply remove your filter from the tub. Then give the spa filter a thorough rinsing with your hot tub filter cleaning wand. You don’t need any soaps or cleaners to do this, but make sure you get in between all the pleats on the filter where the deposits often build up. Ideally, you should change the water in your hot tub every three months. You should perform a more thorough cleaning of your filter at this time as well. To do this, you will rinse the filter as before with the routine cleaning and then soak your hot tub filter overnight in a non-foaming solution that is designed for cartridge hot tub filters as we mentioned above in the chemical section. Rinse it again and let it dry before reinstalling. It’s a good idea to keep two filters on hand at all times. This way you can always have a clean filter ready to install when it comes time to give your hot tub a thorough cleaning. Hot tub filters no matter how often you clean them should be changed every year for optimum performance. Your hot tub filter is essential to your hot tub’s power pack operating properly. You will want to replace your filter when it shows signs of wear or damage. Also if there is a lack of water pressure going through it. A dirty or over used filter may compromise other parts of the system. This will cost a lot more to repair or replace then a hot tub filter. 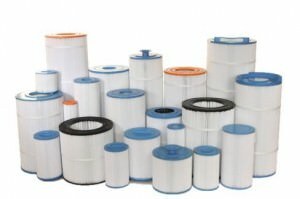 The Cover Guy has a complete selection of filters to choose from at discount prices. Take advantage of The Cover Guy replacement hot tub filter easy filter finder.